We work hard her to be an excellent source of original content. Every once in a while we run across an article that is just so well put together and useful that we can not help but share it. 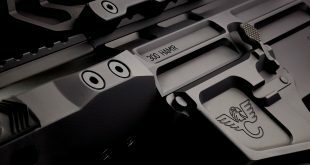 GearScout took the time to very carefully in an extremely illustrative way capture the grip angles and contours of 21 of the most popular pistol grips used on the AR-15 platform. We highly recommend you take the time to go to their site and check it out as it has a wonderful multimedia presentation with it. You can see an abbreviated version below if you prefer. 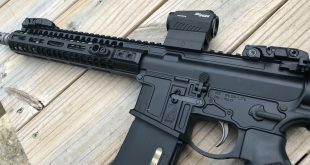 The evolution of the AR rifle grip began not long ago when shooters realized they no longer fired their weapons using stances developed in the 1960′s. Back in the day, armorless shooters were taught to use the bladed stance and a high elbow. But today, body armor and enhanced understanding of body mechanics during shooting and weapon manipulation has lead to changes in how a rifle is shouldered. Emerging doctrine now teaches us to shoot with shoulders squared up to the target and elbows tucked in for stability–and to keep from getting shot in the arm. To accommodate the updated stance, gripmakers have changed the angle the grip sits at on the rifle’s base. Looking at a rifle from the side, you’ll see the bottom, leading edge of the newer grip is further forward. Reducing the grip angle allows shooters a straighter wrist which translates into better trigger control, more recoil control and a stronger grip for weapon manipulation. 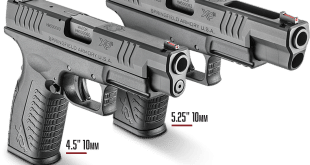 Look at the range of grips offered today and you’ll see the evolution is underway, with a range of choices that accommodate AR shooters with large, average and small hands shooting from bladed or updated stances. 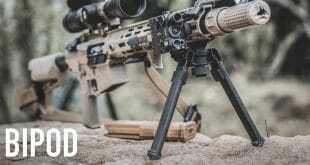 The grip is the most intimate gripping surface of the rifle and has spawned a huge breadth of options to serve the comfort and efficiency interests of all shooters. The USGI A2 style grip took the flat A1 grip and added the finger groove up top and ditched the sling mount at the grip’s base. The knurling and ergonomics are all the same as the original. Grip angle suits a more bladed shooting stance. $4 Colors: BLK. 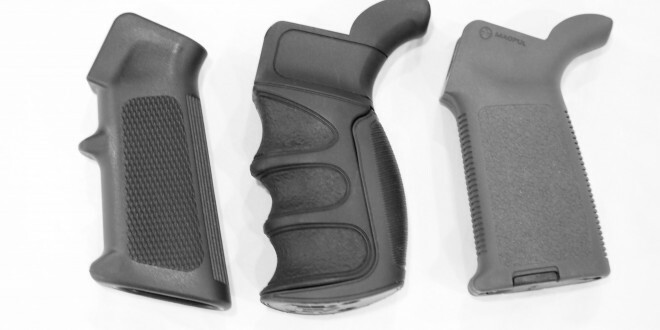 Both BCM Gunfighter’s Grips have reduced angle grip to optimize fire control ergonomics when employing modern weapons manipulation techniques. Trap door storage compartment, the MOD 0 features a slim design, similar in size to the A2 pistol grip. The smooth insert is shown above, and the extended insert is shown below. $35 Colors: BLK, FDE, FOL. The BCM MOD1 uses the same reduced grip angle as the MOD0, but has a high rise back strap for a higher grip or for use with larger hands. Both BCM GFGs come with two modular trigger guard inserts that close the gap between the trigger guard and grip. The smooth insert is shown above, and the extended insert is shown below. $35 Colors: BLK, FDE, FOL. Rubber overmolded “Suregrip” surface feels soft, but firm almost like a pencil eraser. Ambidextrous with highrise backstrap and slight stippling, the grip follows the A2 angle, but offers far better traction and comfort. Includes the Ergo Gapper to fill the gap between the grip and trigger guard present on some rifles and a plug to seal the hollow grip. Also comes in a non-rubberized surface (#4015). $27 Colors: BLK, FDE, ODG. Light, textured, overmolded. Uses the A2 angles while offering modest finger grooves and palm swells. Fits AR15 pattern rifles. $22 Colors: BLK. Available in two sizes; regular for 5.56 receivers, shown, and extended for 7.62 receivers. Features subtle swells that fill the hand without feeling like finger shelves and staying ambidextrous. The front flat makes the grip feel more structured and substantial. Also choose regular (shown) or rough texture. Fits and AR15 rifle. $28 Colors: BLK, FDE, FOL, ODG, UDE. The MIssion ADaptable Grip is a offers three interchangeable rear straps to accommodate all hand sizes and two front straps; A2-style and A1 (no finger shelf) style. Solid feeling despite its modularity, the MIAD offers lots of options including choice of optional core storage modules. All the backstraps are shown below. $36 Colors: BLK, FDE, FOL, ODG. Conventional grip angle with reinforced polymer body construction uses comfortable, wrap-around rubber overmolding for weapon control in grip-challenging environments. This medium sized grip features soft serrations in the front and back and a hard-polymer bottom edge. Comes with a basic grip cap and will accept optional Magpul storage cores. $24 Colors: BLK, FDE, FOL, ODG. store. Provides a low profile, compact design and steeper grip angle compared to more traditional styles. Works well on smaller Personal Defense Weapon AR15 configurations, the slim profile also makes it an excellent choice for shooters who prefer a smaller grip circumference. $20 Colors: BLK, FDE, FOL, ODG. Replaces trigger guard. Working on a non-trigger guard version. More raked angle for upright, non-bladed stance. Polymer constructions is solid with slightly tacky, overmolded feel without the squishiness. Rounded shape is comfortable for average hand while highrise backstrap offers improved leverage. Replaces stock trigger guard with oversized integral trigger guard. Stark is working on a non-integral version. Grip plug holds a pair of CR123s, or AAs. SE-2 versions include hook mount or QD swivel mount. $40 Colors: BLK, FDE, ODG, Digital Desert camo. Stark has introduced the first AR-15 pistol grip to integrate an ambidextrous sling mount. The SE-2 is available in two versions. The Hook Mount (above) provides a loop compatible with most common sling hooks; The Swivel Mount, below, allows the attachment of push-button sling swivels. The SE-2′s sling mount is located above the hand and below the buffer tube, with a low profile design that stays out of the way of even fully collapsed M4-style stocks. When added to AR pistols, the SE-2 provides excellent one-handed control while providing sling attachment that doesn’t clutter up the receiver extension. $50 Colors: BLK, FDE, ODG, Digital Desert camo. The BG-16 fits all AR-15 and AR-10 series rifles and clones. The grip angle is the same as the A2 grip, but has a little more meat on the backstrap and more surface stippling. It includes sealed battery storage tubes, foam spacers, stainless steel hex-head bolt, wrench. $36 Colors: BLK, FDE, FOL. Same features as B16, but in a larger format. Works with any rifle configured to take a standard AR-15 grip. Has an unstructured storage compartment. $38 Colors: BLK, FDE, FOL. Small and thin. For small hands or small guns; or both. Fits AR15 patterns and FN Scar rifles. $20 Colors: BLK, FDE, ODG, TAN. The most aggressive grip surface of any grip here. Resin/epoxy surfaced grip emulates grip angle of A2 and removes finger grooves. Will also remove skin and paint from vehicles if improperly employed. $45 Colors: BLK.